We make moving water easy. 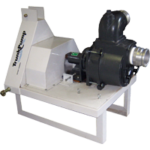 Our PTO water and trash pumps feature a simple design with high quality components. TP-2PTP 2” Pressure 135 8100 88 205' No 32 x 26 x 37 225 lbs. TP-2PTR 2” Trash 220 13200 49 115' 1.00" 32 x 26 x 37 225 lbs. TP-3PTR 3” Trash 320 19200 45 105' 1.25" 32 x 26 x 37 225 lbs. TP-4PTR 4” Trash 520 31200 52 120' 2.00" 32 x 26 x 37 325 lbs. TP-3PT 3” Dewatering 440 26400 52 120' Dirty Water 32 x 26 x 37 200 lbs. TP-HYD2 2” Hydraulic 240 14400 37 85' Dirty Water 26 x 20 x 20 70 lbs. TP-HYD3 3” Hydraulic 280 16800 37 85' Dirty Water 26 x 20 x 20 72 lbs. 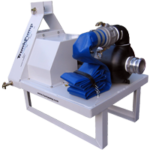 TP-3VS 3” Ventrac/Steiner 310 18600 37 85' Dirty Water 30 x 26 x 16 73 lbs. Can’t find a dealer near you? Give us a call at 866-381-1565. 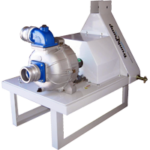 Questions about our products? 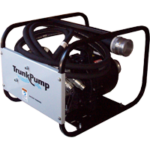 Want to become a TrunkPump dealer? Send us an email or give us a call. 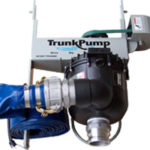 We love to talk pumps. © Copyright 2019 Lowell Scott Enterprises, Inc. All rights reserved.